Using nutrition and diet to treat ADHD is a natural alternative to using medication, and the Feingold Program can help parents whose children who have ADHD and other behavioral and health issues. When parents finally get to the point of having their child tested for ADHD, and the diagnosis is positive, doctors have a selection of medications that they want the child to try. Most parents do not want to medicate their child. They feel that there is a better way to handle the ADHD diagnosis in a more natural way. The Feingold Program removes for the child’s diet foods with synthetic additives. It also eliminates foods that contain salicylates, which occur naturally in certain plant foods, such as tomatoes, peppers, cucumbers, oranges and grapes. Furthermore, the Feingold Program also removes anything artificial or has fragrances. For example, toothpaste and laundry detergent contain chemicals and fragrances that can trigger ADHD like symptoms. While not all doctors are on board with using Feingold, parents should try using nutrition and diet as a natural alternative to treating ADHD before medication. There is nothing to lose, especially if your child’s behavior is indeed caused by a sensitivity to certain food additives. Using this program as a natural cure for your child’s ADHD takes discipline. You will need to throw out anything that is not considered a “safe” food. You will have to be vigilant about reading labels in the supermarket and sticking to the program. Any deviation in the first few weeks will muddy up any conclusions you are trying to reach. This holistic way of treating ADHD is done in two stages. You need to be on Stage One from four to six weeks. Then in Stage Two, you reintroduce the natural salicylates-the fruits, vegetables and herbs that are on the “remove” list in Stage One. You do not reintroduce the artificial chemicals into the diet. When you join the Feingold Organization, the easy to read materials tell you exactly what to do step-by-step. It shows you how to read food labels, and which foods are safe and which to avoid. You do not have to relearn how to cook, a common misconception. 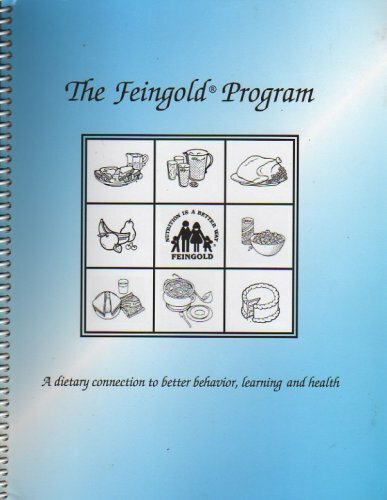 The Feingold Program teaches you how to prepare meals their way. For example, you buy better foods, like natural bread crumbs instead of the chemical filled ones, to bread your chicken or make your meatballs. I learned about using nutrition and diet to treat behavioral issues from a friend. My son, a boy with a big heart and gentle soul, would have these outbursts that came out of no where. He could not control himself, nor could I calm him down. As a mother, I saw this red flag waving in the air but had no idea what to do about it. He did have a moderate case of Sensory Integration Dysfunction, but he had received therapy for it and was dismissed. No, this was something totally not related to his sensory issues, of that I was certain. He was not a hyperactive child. His behavior was something that I could not put my finger on. I decided to do a blind test using diet and nutrition as a natural way to cope with my son‘s behavioral issues. I ordered the materials from Feingold and read them like a madwoman. I threw out everything that was bad. I told my family that we were going back to eating more natural and organic foods and snacks to help my older daughter with her cholesterol issues. I stuck to diet, hoping to see changes in my son’s behavior. Two weeks into our new way of eating, I asked my husband and older daughter if they had noticed anything different about our favorite boy. Both said that he was calmer and better behaved. That’s when I told them about the new healthy eating program we were on. They were both impressed that changing our diet to a more natural one help with his behavior issues. Several weeks into the program, my mom and I went out to take the kids to a fast food place for lunch (yes, there are safe places to eat out). My kids begged for an ice cream sundae for dessert, and my mom got it for them. I had reservations, as I knew the ice cream was not natural. But I was also curious about what would happen. About two hours after eating the vanilla ice cream, which contained vanillin (artificial vanilla), my son was outside with sidewalk chalk and wrote his entire name backwards and in reverse! I had read about this side effect in Jane Hersey’s book. This was even more proof that I had to use nutrition and diet to control my son’s behavioral issues. Almost four years after starting the Feingold Program, we are still a Feingold family. My son does occasionally have forbidden foods, and we deal with the consequences, as he still had food sensitivities. I strongly recommend trying this out to anyone who has a child who has been diagnosed with ADHD or has some other type of behavioral issues. While it does not work for everyone, using nutrition and diet to treat ADHD as a natural alternative, with the Feingold Program as a guide, will help parents avoid medicating their children unless they absolutely have to. Wow, nice article. I have to tell you that your title is the longest one I have ever seen. Also, I love that you are using the HTML to use blue on your sub headings. I do that on my blog but didn't think to do it here. Thanks. Great information to share. Your readers should go to www.feingold.org to find out more about the Feingold Program and the support group, the Feingold Association. Yes, they are very helpful. My son has not been diagnosed with ADHD, but I have noticed that what he eats has a huge impact on how he behaves and reacts to things. Thanks for the article! It is very true for many kids. You are what you eat! I am glad that I could help.